Rev. 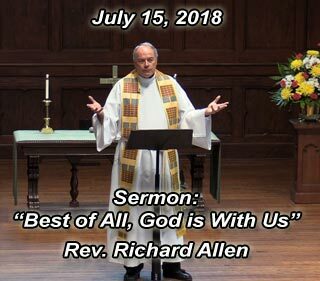 Richard Allen is a retired United Methodist pastor and a member of the New York Annual Conference. He is a graduate of Wofford College and Yale Divinity School. Prior to retirement, he served churches in South Carolina, (Columbia and Myrtle Beach) and New York (Mamaroneck and New York City). Richard grew up in the South Carolina Lowcountry, and he and his wife, Lynne, divide their time between their homes in Bluffton, SC and New York City. They both joined Asbury Memorial UMC in June of this year.